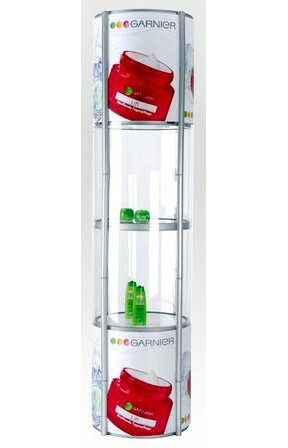 The unique snap-up circular product display tower stand creates great eye-catching attention as it stands at over 7 feet tall. The display case snaps up to its height of 7 feet from a compact folded position and fits into the included carrying case. Once up, the display case features 5 levels of shelves to place any products or literature. In addition, graphic PVC full color custom panels can be added to part of the display case to increase the visibility of the display (graphic printed PVC panels is just $30 each). Unique spring loaded snap up design allows set up and take down to be very simple. The display is made out of durable yet lightweight aluminum for easy portability and sleek professional look. 3-Tier Table snap-up display also available.